This is the second episode of Danny Phantom I've seen, the first being the pilot. Had the pilot been more interesting, I might have watched a few more. The series is about a kid who winds up with ghost powers (flight, phasing, the ability to shoot blasts from his hands for some reason, and a handful of others) in a lab accident. He uses these abilities to battle actual ghosts, like you do. From what I've seen, the show's biggest problem is its uneven tone: the premise leans towards superhero, but the style is aiming for Hanna-Barbara. It's a mix that can work in the right hands (Powerpuff Girls being the obvious example), but this lacks a distinct voice and interesting characters. That's a critique of the series, not the episode. 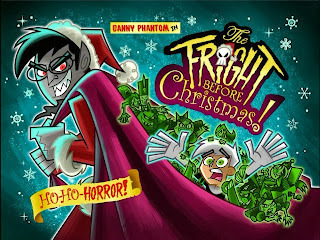 Actually, thanks to a cool premise, "The Fright Before Christmas" sidesteps these pitfalls and delivers something that's actually pretty cool. The episode opens the day before Christmas. Everyone's in the holiday spirit except Danny, who's upset his parents spend every Christmas arguing whether or not Santa exists (this should offer a good gauge for how much the show respects its characters). He goes into a ghost dimension to let off some steam and accidentally destroys a poem a ghost has written. The wronged spirit is a new character called "The Ghost Writer," who reveals he has the power to write Danny into one of his poems. This leads to a "Visit from St. Nicholas" style poem chronicling Danny's day where Danny alone is conscious of the narration and constant rhyming. It's not a new trope, but it's certainly effective. From here on in, the plot is bizarre but fun. 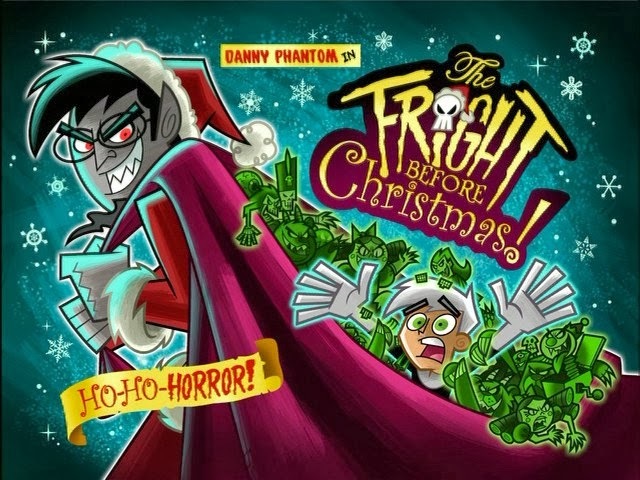 Danny's forced to contend with a giant nutcracker made of possessed presents and an army of possessed Christmas trees (leading to a particularly cool sequence where his mom comes to his rescue wielding a pair of double sided axes). The ending shoehorns in a bunch of the series' villains, but does so in a way that works. I have no idea whether being familiar with these characters would have made this even better or just annoying, but I liked how they played into the resolution. This is a surprisingly cool holiday episode, held back by its shortcomings as a series. There's a lot here that's great, but most of the characters feel like generic knockoffs of Cartoon Network's. That description works for the show as a whole, in fact: this was clearly in the same era as Powerpuff Girls and Dexter's Laboratory, but it doesn't approach their ability to balance whimsical and badass. If you come across this episode, give it a chance: it's a lot of fun. Just don't expect to like the minor characters.